Here is a list of some links I find helpful and/or inspiring. If you have any suggestions, please feel free to leave a comment. I won’t post your comment, but I just may add the link you suggest! Be sure to check back every so often, because I’ll add to this page as time goes on. I hope these are helpful for you! This link explains what the Lutheran Church-Missouri Synod believes. If you aren’t familiar with Lutheran beliefs, here’s a great way to learn about them. There is even a link for “Frequently Asked Questions,” as well as a section on the “What About” series. These are invaluable resources that cover 27 different topics, such as the Bible (how we got it, how it was translated, etc), Baptism, Lutheran Worship, Creation and Evolution, and many more. And speaking of CPH, this is their blog. It has some great articles on various topics like marriage and Christian living, as well as keeps you informed of new releases coming out. It’s a wonderful resource. This is a talk radio link that allows you to listen to live or on-demand podcasts. There is also a link for publications, where you can download a PDF version of an Issues, Etc journal. A wide variety of topics are available. If you’re looking for unique artwork, check out this link. Anthony Hessler, who has been a guest author on this blog, designs these beautiful pictures using nothing but text. 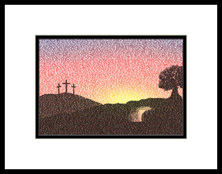 His gallery includes religious pieces such as Bethlehem, Calvary, and Easter SONrise (pictured), as well as non-religious pieces like Old Glory and Red Rose. This is a blog that focuses on “Living our vocations as Lutheran women.” It’s written by women, for women, and is “an online source of Lutheran encouragement, community, and advice. This is where you can find discussions of relationships in a Law and Gospel context. Topics range from living the single life, to building cross-generational friendships, to teaching children to behave respectfully in church.” I’m an occasional guest author on this blog and re-blog their posts from time to time as well. Author Mary J. Moerbe’s blog, “Conversation & Community for Lutheran Writers,” has an impressive compilation of Lutheran authors, blogs, and freelance writers support. I find it to be a useful resource with many links and suggestions. Here’s another blog I write for occasionally. As the title suggests, it’s a blog for parents who strive to raise godly children in a world that’s anything but. There are some great articles on there that I hope are as helpful to you as they are to me. This is an excellent resource for creation and evolution. Founder Ken Ham has compiled a great deal of information that is helpful in understanding and responding to evolutionist arguments. There are archived articles, newsletters, and even online books for free. Definitely worth your time if you have questions about either creation or evolution. I appreciate the letter of apology that widens the scope of the women who aren’t mentioned or invited to such an event. Do they care that they weren’t invited? Would they care to have been included? I am just as happy to be outside, yet I would have enjoyed one-to-one conversations with those in need of healing, or encouragement that they are worthy as a woman and child of God. It didn’t seem like a venue that offered many opportunities like that. So maybe my choicr to stay home was better, where I focus on lonely senior neighbors around me, millennial friends of my kids who are starting families, and ministry with my husband to people from the Middle East. We all have places where we can find people in need of kindness. I wonder how many marchers really had the chance to meet a need, rather than making noise and leaving behind trash and signs that somebody else had to clean up. Did they educate others about specific issues? Did some of them discover ways that they could go home and become involved as a change agent? Those are the unreported outcomes of such a March that would have made it worth the trouble. This whole blog didn’t make any sense at all. Are you serious lady. What is wrong with you. How exactly do you equate woman marching for HUMAN Rights to not caring about people around the world. You cannot call yourself a christian if you are not willing to speak up for his children. I am sure you are one of those people that get their news from fox…enough said!! They actually had footage of the infamous “trash” picture, where they pretended the march somehow look left litter everywhere and was disrespectful. The trash was PLANTED so people like you that are gullable have something that you think you can cast aspersions on and sully the true meaning behind these marches. I think you need to crack open your bible more instead of being a spin doctor who bends the truth to fit your narrative. True Christians want ALL gods children to be treated fairly with no differentiation for the color of their skin, people with disabilities, old, young, man or woman!!!!! !